Conceptual “Chinese whisper” release from Edda Magnason and Adrian Recordings Artist: Edda Magnason Title: Jona Catalogue number: arweb 139 Label: Adrian Recordings Release: EP 1. 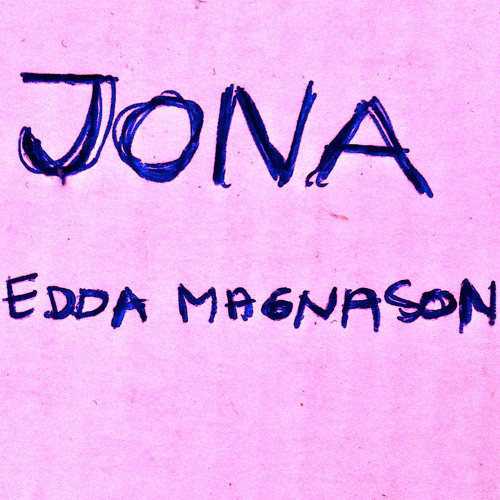 Edda Magnason – Jona 2. Edda Magnason – Jona (Vidderna Remix) 3. Edda Magnason – Jona (Vidderna Remix) (Niva Remix) 4. Edda Magnason – Jona (Vidderna Remix) (Niva Remix) (Justus Köhncke's BLAX OMEN Remix) Edda Magnason released her second album, Goods, (first on Adrian Recordings) last year to worldwide critical acclaim. It was also announced that she will be playing the leading role in a major film project about the Swedish all time great jazz singer Monica Zetterlund. The filming is taking place right now, but just before she went into the actor bubble, she recorded one off track that we now are releasing in one of our most interesting concepts up to date. The release has one baring concept line in form of a musical ”Chinese whisper” and some bonus features. This is the story: Edda Magnason went into the studio with long time friend and mega electro pop star Familjen in the producer’s chair. Together they recorded her track Jona. That’s the first track of the release. Instead of adding the usual 2 or 3 remixes of the track we started a “Chinese whisper”. We asked Vidderna to do a remix of the original track and then we asked Niva to do a remix of the Vidderna remix, without hearing the original, last Justus Köhncke remixed the Niva remix without having heard either the original or the Vidderna remix. It all became a musical “Chinese whisper” going from Famijens nearly Portisheadish sound to deep underground German techno from Justus Köhncke. This creates the EP Jona by Edda Magnason. 1. Edda Magnason – Jona The original track is produced by fluorescent Swedish electro star Familjen. Best known for his worldwide hit Det snurrar i min skalle. In 2012 he will release his 3rd album. 2. Edda Magnason – Jona (Vidderna Remix) Vidderna is the name of Niklas Tjäder. Deeply associated with the progressive disco sound of Malmö. He is also a live musician with Korallreven. Now touring the world. 3. Edda Magnason – Jona (Vidderna Remix) (Niva Remix) Niva is Sweden’s new contribution to the more danceable chill wave scene. His singles and remixes are floating around the web with high remarks in big magazines like Line of Best Fit and Pitchfork. He will release his debut album in 2012. 4. Edda Magnason – Jona (Vidderna Remix) (Niva Remix) (Justus Köhncke's BLAX OMEN Remix) Finishing of the release is the legendary German disco and techno producer Justus Köhncke. Nowadays best known for his work for the German techno label Kompakt, but even before that he was a big star on the European electronic scene as a member of the trio Whirlpool Productions that had a big hit with From Disco to Disco. In later days he has collaborated with Can’s Irmin Schmidt and been drawn to a more krautish sound. Here, however, he delivers a warehouse underground techno banger. In addition to this Nisse Axman has made moving graphics, let’s call it videos, to the full release. And as bonus features we throw in Edda’s demo version of the track, also recorded by Familjen though. When we asked pop sensation Simian Ghost to make a Adrian Recordings Advent Sunday Mixtapes he mashed up the Vidderna remix with a track from Den svenska tystnaden called Du ser träd and all of a sudden we had yet another fine bonus track to this release. You’ll find them all online at www.adrianrecordings.com.